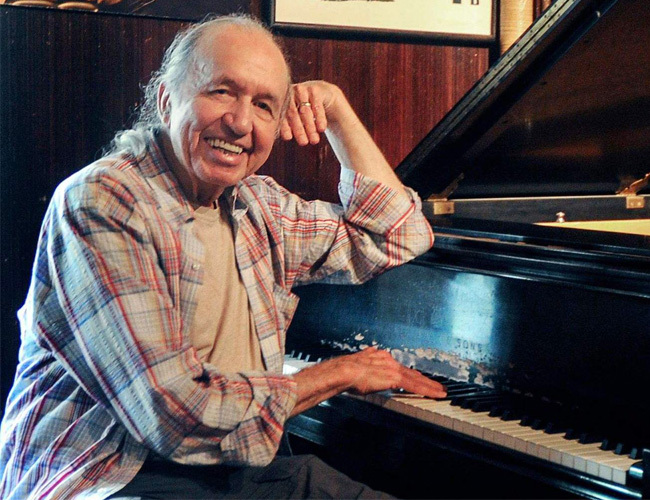 Robert "Bob" Dorough—the jazz pianist/composer, lyricist, singer, bebop hepcat, and Schoolhouse Rock! composer and writer—died yesterday at the age of 94. As the remembrances of him roll in, it’s becoming clearer and clearer that he was not only a huge source of fantastic childhood memories for millions of kids that grew up watching the educational TV series, but also one of the coolest dudes around. Case in point: The first time he met Miles Davis, at a Miles Davis concert, Mr. Birth of the Cool himself asked Dorough to go on stage and sing a song. Obliging his new fan, Dorough joined Davis’ bassist Paul Chambers and drummer Jimmy Cobb for a rendition of "Baltimore Oriole." The song—which Davis had recently heard on Dorough’s debut solo album Devil May Care—would end up stopping the set. But the list of artists that Dorough worked with extended far beyond Davis. Below, in honor of his life, listen to some of the greatest (and strangest) songs he wrote, arranged, or played. Schoolhouse Rock! - "Conjunction Junction"
As perhaps his best-known song, "Conjunction Junction" was one of Schoolhouse Rock!’s most popular lessons. But the tune’s bluesy piano riffs and elastic wordplay were, by 1974, second-nature to Dorough. Spanky & Our Gang - "Pedagogical Round"
Dorough and his songwriting partner at the time, Stuart Scharf, were enlisted by the vocal-harmony folkies in Spanky & Our Gang to bring in new songs and jazzier arrangements. As you can hear in this "Pedagogical Round," which playfully teaches vocal harmonies within the composition and predates Schoolhouse Rock! by four years, Dorough was already finding his later calling. The Fugs, an unkempt gang of proto-hippies that an FBI file once called the "most vulgar thing the human mind could possibly conceive," expanded their sonic horizons with slick production techniques on 1968's It Crawled Into My Hand, Honest. Dorough lent his songwriting prowess and a Vatican-worthy choral arrangement to this ode to marijuana. The Staple Singers - "Give A Damn"
Another song written by Dorough and Scharf, "Give A Damn" was the theme song for the New York Urban Coalition, as it launched a campaign to end landlords’ abuse of black and impoverished tenants. Here, you can hear the Staple Singers’ version of the song, which was also covered by Odetta. Mel Tormé - "Comin’ Home Baby"
Adding lyrics to an instrumental track by Ben Tucker, Dorough had a huge hit with this song in 1962 when Mel Tormé sang it. Many other artists, like Quincy Jones, Herbie Mann, and even Michael Bublé with Boyz II Men, have since covered it. Allen Ginsberg - "The Echoing Green"
Allen Ginsberg, bard of the Beats and countercultural ambassador that he was, had numerous guests on his various recordings where he put poems to music—among them Bob Dylan, Don Cherry, Joe Strummer, and Bob Dorough. Dorough played piano and harpsichord on Ginsberg’s 1970 album, William Blake’s Songs of Innocence and Experience, where Ginsberg sang the ecstatic poet’s words above Dorough’s deft playing. Miles Davis - "Nothing Like You"
As mentioned above, Dorough had a long relationship with Miles Davis, and ended up singing on two of Miles’ records, including "Blue XMas (To Whom it May Concern)" and "Nothing Like You" off of Miles’ 1967 album Sorcerer.